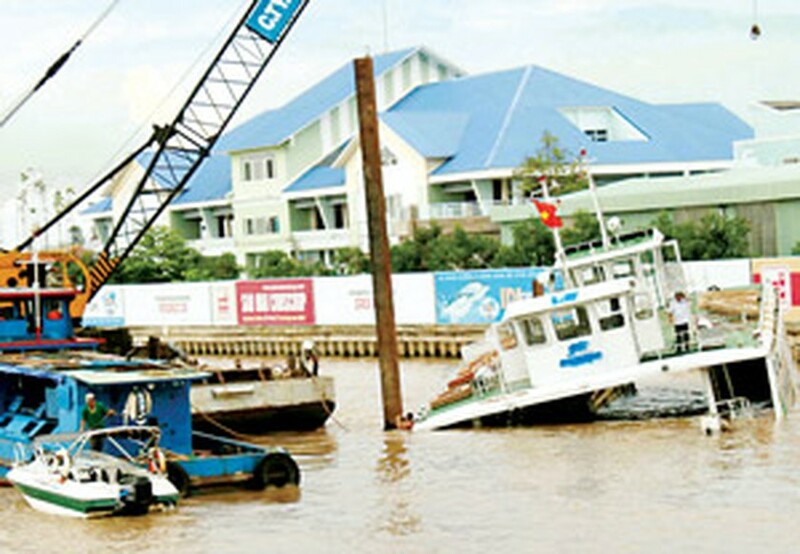 A collision between two ferries on the Hau River in the Mekong province of An Giang early Thursday morning sank one of them along with six cars, but all the passengers and staff were rescued. No deaths were reported. The accident took place at 1AM at Vam Cong Ferry Station in Long Xuyen City. While a 200-ton ferry was approaching the wharf, it collided with a 100-ton ferry that just left the wharf. The crash made a big hole on the smaller ferry, coded K100. It was rapidly full of water. As the accident site was at the wharf, rescue workers with boats around succeeded in taking more than 100 passengers and staff, and motorcycles out of the sinking ferry. Six cars sank with the ferry. The reason, according to Vam Cong Ferry Station director Nguyen Van Trang, was a sudden blackout took place in the captain cabin while the bigger ferry was approaching the wharf. The captain failed to control the ferry and it hit the smaller ferry. The accident caused serious traffic jam at the ferry station. After sunrise, the rescue force managed to fish the sunken cars from the river. Then they were due to use cranes to lift up the sunken ferry out of the river.